Shyamalan is a man with a reputation for telling stories with a twist. So like other movie-goers familiar with his work, I went in looking for dead people. Despite the best efforts to scare the audience with mournful sounds emanating from creatures hiding in the woods surrounding the Village, I didn't see any ghosts. What I saw unfold was an engrossing morality play. First let's pop the surprise for everyone who hasn't seen the film already: The Village is a sanctuary for those who have lost loved ones to the kind of violence reported in the crime blotters of any major American city. Stabbings in alleyways. Desperate suicides. Muggings. Gangland killings. The Elders, as the founders of the Village are called, suffered them all. To assuage their grief, they decided to create a hidden society free from violence, a new Eden, plopped down in the middle of what is ostensibly a wildlife sanctuary. The sanctuary is off-limits to all human visitors including planes that might otherwise fly overhead. The Elders raise families in The Village and teach their children that the world outside their borders, known collectively as The Towns, is evil and is never to be visited or even spoken of except in frightened whispers. The Elders keep their children's innocence intact with a Big Lie, a simple but effective legend of Those of Whom We Do Not Speak. These creatures rule the surrounding woods and agree not to threaten those who live in the Village as long as they stay in the Village. As the Elders' children reach maturity, a particularly bright one begins to ask questions about their way of life. After the Elders had decided it was better to let one of their children die than to risk contaminating their Eden with contact with the outside world, Lucius Hunt asks permission to breach to the border so he can bring back medicines for treating what he believes are preventable illnesses. To discourage Lucius, the Elders step up the Big Lie with more and more grotesque visitations from red cloaked creatures, Those of Whom We Do Not Speak, and the bodies of skinned pets strategically placed where all the little kids could stumble across them. The ruse nearly works until Lucius and Ivy, the lead Elder's blind yet supremely capable daughter, decide to wed. Then steps in Noah, the village idiot. Ivy loves Noah like a brother. He loves her more than a sister, however. When Noah nearly kills Lucius in an uncertain fit of jealously he doesn't understand but acts upon like any spurned lover, the first crime is committed in Eden. Ivy takes it upon herself to ask for permission to go for help. The point at which she breaches the final barrier to the outside world is when the Shyamalan twist is sprung. The morality play itself is somewhat less obvious. In consistent Shyamalan fashion, one should examine first the names of the main characters. 'Lucius' closely resembles the name Lucifer. The much maligned antagonist of the Bible is, in this case, presented as the Bringer of Light, the light of knowledge and self-awareness, not evil. Ivy is Eve. Her relationship with Lucius is what tempts her to seek out help and, in the process, understanding the Village's place in the big, bad world. Noah is Adam and Caine rolled into one. His idiocy is the ultimate innocence. Even though he is intellectually incapable of realizing sin, his innate human nature makes him more than capable of evil. Therein lies the flaw in the Elders' plan for Eden. These refugees could take themselves out of the world but they couldn't take the world out of themselves. The Elders redeem themselves and their hidden colony by deciding unamiously to keep up the ruse for the sake of maintaining the innocence of future generations. They accept that their rendition of Eden is not perfect since it's all they've got. 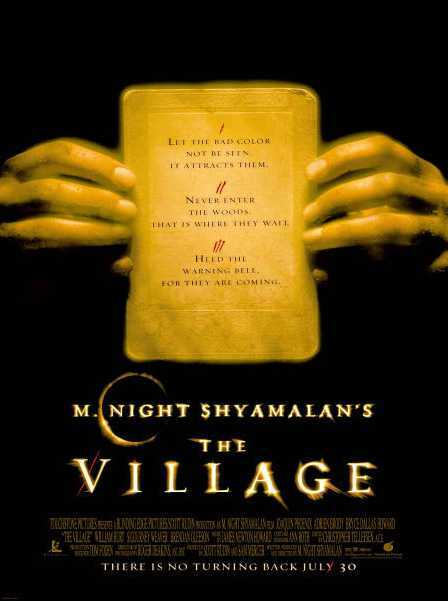 The weakness of The Village is that is a predictable re-telling of a cliched story. The strength of The Village is that the audience can ponder once more the value of innocence lost, a lesson learned by every generation as it comes of age.